Home / Client Authored / Boost Your Body’s Backbone! How Do You Take Care of Your Spine? We’re always on the lookout for resources to help our patients get better quickly, stay better longer and empower themselves to take control of their health. Chiropractic care offers you an amazing way to help your body’s structure through visits to our office. But what can you do to help your spinal health when you’re at home? 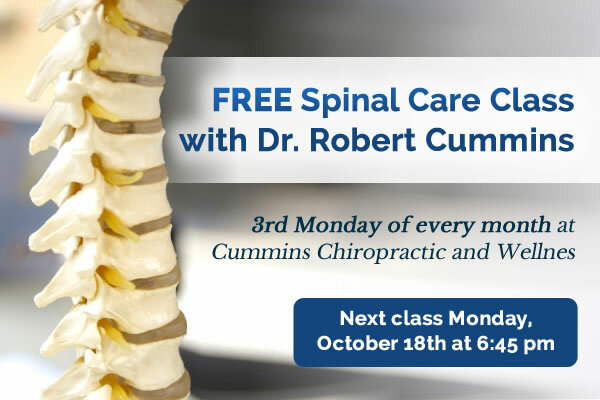 The class will give you a wonderful foundation for spinal care, providing basics that are useful for everyone. At the end, you’ll receive a packet of information to take home with you, so you don’t need to worry about taking notes while Dr. Cummins is speaking. We’ll start promptly and move efficiently through each topic because we respect your time. We encourage our patients, their family and friends and all members of the [PJ] community to stop in and learn how to take care of their spines!